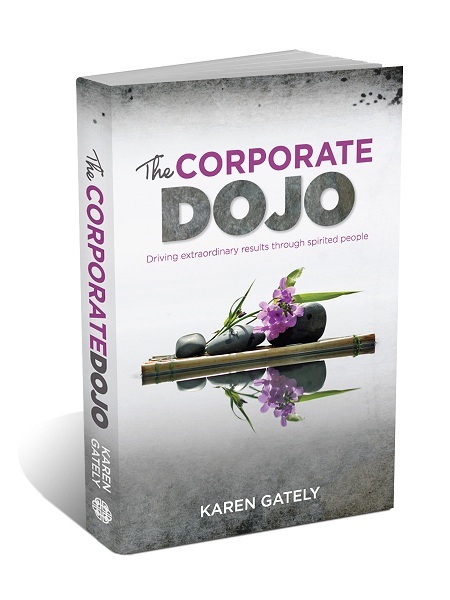 Karen Gately, author, 20-year HR professional, and 3rd dan karate black belt. In this insightful manual, Karen Gately offers a unique and compelling approach to people leadership— an approach deeply founded upon the 25 years Karen spent in the dojo, first as a student of karate and later as a sensei in her own right. The essence of her leadership philosophy is this: by motivating and drawing out the best of people’s abilities and talents, and by providing a spirit-strengthening environment in which people can work, relate and grow, corporate leaders can shape the growth of their organisations, the development of their team members, and ultimately, by extension, the wellbeing of our global communities. Drawing from real-life experiences both in the office and in the dojo, Karen illustrates the essential hows and whys of ‘growing people’; she explains the power of spirit and the weight of its influence in the workplace; and through it all, she invites the reader to envision and aspire to a thriving world in which businesses and their teams function as a force for good. A book for established CEOs, new graduates poised to ascend the ladder of corporate leadership, and everyone in between, The Corporate Dojo is a must-read for passionate leaders in any environment.